1st Place: Ron Fabiszak will lose. He has to lose. No one can win them all. Right? Or perhaps, Ron possesses powers the rest of us do not comprehend. Not convinced? Read on. He dominated again. Even in an event he admits he was “Just trying to catch 8-9 pounds,” to stay amongst the top in the points, he dominates. Professional angler Chip Harrison quips, “Ron can catch fish in a mud puddle right now.” No team has won multiple events during the same season in the R & B history before this season, and this makes three in a row, two of which, he fished solo! This has only happened with an average boat field of 47.
pounder, and saw another similar in size, but that was it. If I could catch 8-9 pounds during the tournament, I was going to be happy.” Whatever. Try selling that line again at the next tournament Ron! Because of that poor practice, he began on Syracuse and caught a single six inch fish. Thus, he moved to the only area on Wawasee he knew held better than average fish. His first 10 casts was a spectacle most of us only dream about. Casting a C Flash 44 Bluegill (pictured right), “I caught three keepers and two shorts, including my two biggest fish (4.57 and an additional 4 pound fish) on my first 10 casts. It changed the outlook on the day.” Those 10 casts produced nearly 11 pounds, nearly enough to win the event alone. Despite this flurry, he struggled to follow it up with anything significant. 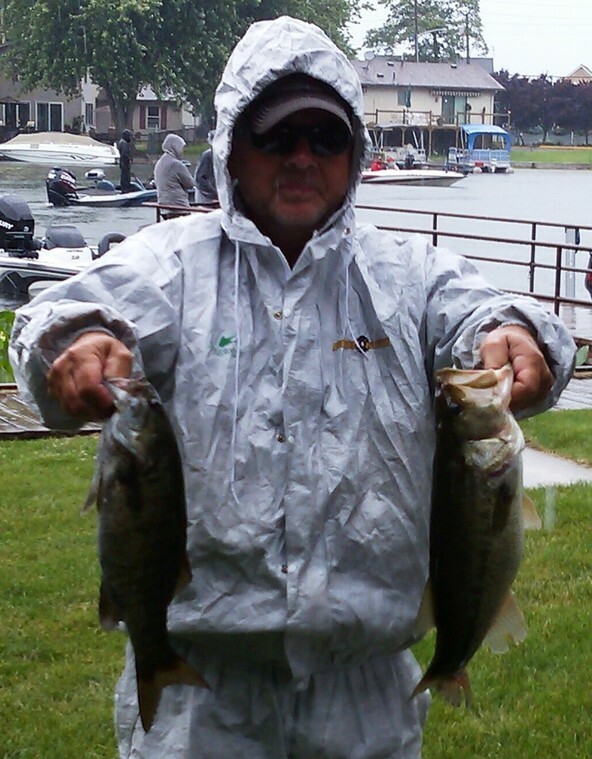 He stayed with the crankbait for several hours on Wawasee, but struggled to catch anything. He swears, “I caught just 12 fish all day - and that counts the pike I caught!” He caught a fourth keeper on the crankbait in another area on Wawasee, but when 1:00 rolled around, there was still vacancy in his livewell. He returned to Syracuse. He recounts, “On my first cast to a boat dock, I hooked and lost a two pounder. 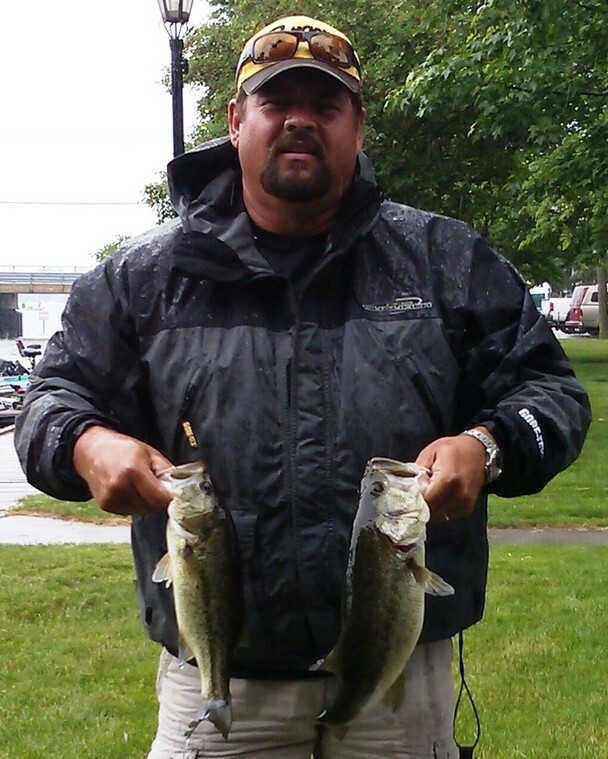 However, 10 docks later, I landed my final keeper.” His best five fish weighed 14.32 pounds which won him $786. 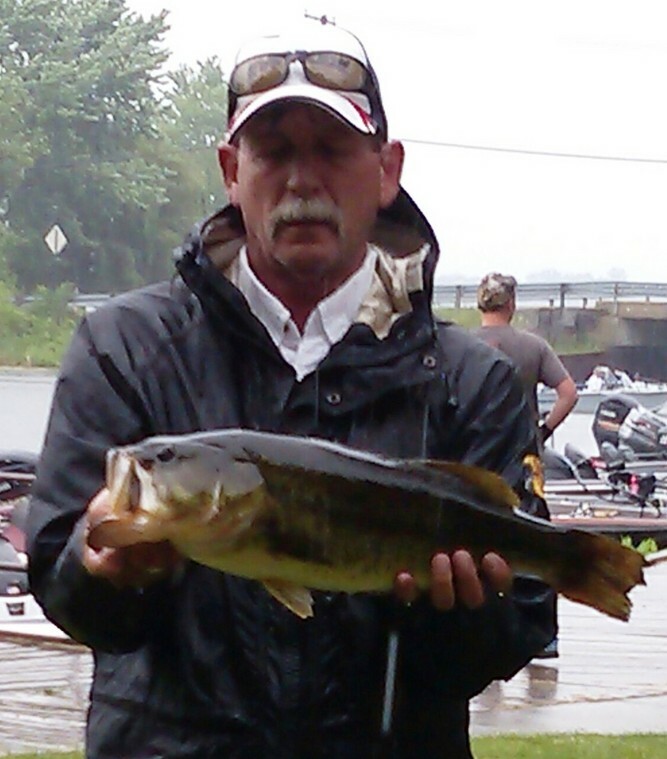 His biggest fish, a 4.57 pound bass, was good enough for the C Flash big bass award. How ironic he would win more of the bait that won the event. One could be tempted to credit luck for Ron’s success more than skill, but Webster and Tippecanoe tournaments serve as proof otherwise. 2nd Place: Ron Crawford and Bo Judd, tournament directors of Strike Zone, made their first appearance at an R & B tournament and left an impression while taking home $506. Their 11.81 pound limit was put together by true ""junk" fishing. Judd acknowledges they threw everything but the kitchen sink, "We ran around to a number of spots we have had success in the past. We caught fish in a bunch of ways... but our keepers came on tubes, senkos, spinnerbaits, and jigs. It was a typical post-spawn bite." The team spent their time shallow, five foot and less, on Lake Wawasee. They ended catching seven keepers, but it was the last keeper that was memorable. What separated their limit from others were two fish over three pounds. Their big bass was 3.32 pounds, but another fish in their sack was a near twin. During the last hour of competition the team worked a seawall when big bass was tricked by a spinnerbait. 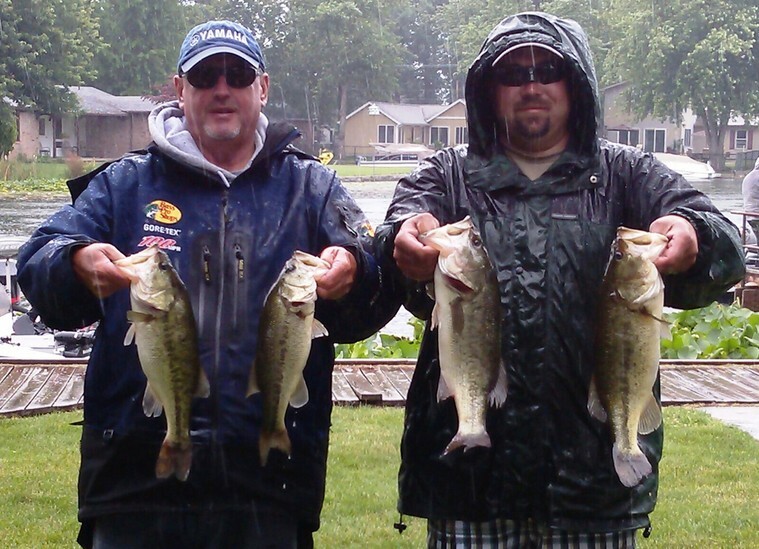 3rd Place: Lake Wawasee gurus Chip Harrison and Brian Whitaker showed why they are perennial favorites on Indiana’s top lake. Most would be thoroughly pleased with a top 5 finish, but they were scarred with a “could have been” moment almost immediately. Harrison recalls, “We lost two fish, a 3 and 4 ½ pounder, in the first 10 minutes of the tournament. But regardless of the losses, they put together a solid 11.72 pound limit that rewarded them $366. edges of the areas we hit. 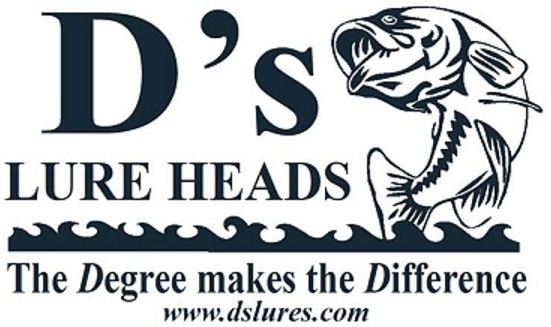 We worked the outside edge with a Poor Boy’s ⅜ ounce jig matched with a Poor Boy’s chunk and slung a shaky head with a trick worm on the inside edge.” While targeting the outside edge their boat sat in 12-14 feet of water, but only 6-8 feet when targeting the inside edge. Harrison further reveals, “We began on the outside edge because we felt the bigger fish were deep, but you only get about half the bites from the inside.” They alternated throughout the day and ended up bagging 11 keepers. 4th Place: Three tournaments: three top 5 finishes. The team of Greg Mangus and Kevin Fletcher have been on fire, and had it not been for the supernatural showings of Fabiszak, teams would be looking up to this team with envy. Also a favorite any time they compete at Wawasee, the team did not disappoint with a 10.96 pound limit that included the second heaviest fish of the tournament - a 4.61 pound largemouth. Their total weight scored them $252, and the big fish gave them an additional $106. 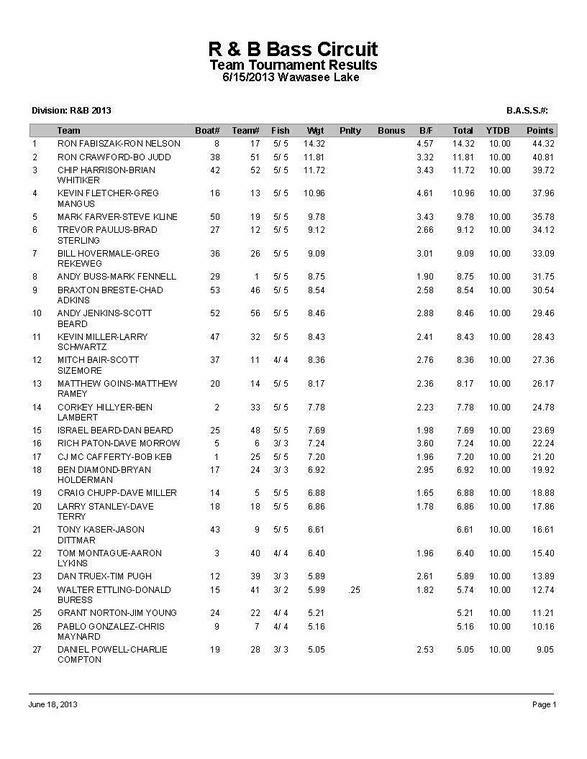 They remain the all time money winners and now take sole possession for the most top 5 finishes in the R & B Record Books. While the bite was tougher than either of them anticipated, they began and stayed on Wawasee all day. They began with Mangus tossing a ½ ounce, green pumpkin Mango jig, while Fletcher threw a Zoom Finesse worm rigged wacky. Fletcher caught a few keepers on the wacky, but Mangus was catching bigger fish on the jig, including their big fish. So before too long, they both slung the jig. They focused their attention on the outside breaklines in three areas. The sweet spot of those areas had an inside cut or other irregularity. 5th Place: Just like Mangus and Fletcher, the performance by Steve Kline and Mark Farver thus far this season, has been nothing short of extraordinary, but a bit overshadowed by Fabiszak. They too, have logged top 5 finishes in all three events. In two seasons, the team has finished in the top 5 six times. This time, a 9.78 pound limit was good enough to win them $224. 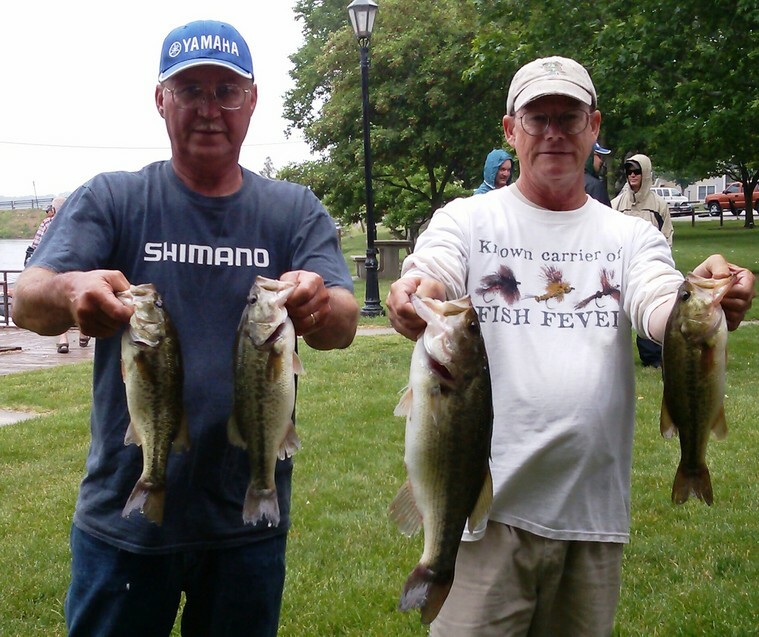 Kline credits Farver for their success, “I was just net boy for Mark!” They began their day on Syracuse Lake and had four keepers, including their biggest - a 3.43 pound largemouth, fooled on a Rebel Pop R bait. But just as quickly as the fish bit the topwater, they also stopped. The team then shifted their attention to Lake Wawasee. Here they worked a green pumpkin Zoom U tail worm with an ⅛ ounce bullet weight along the inside edge of weedlines. The most productive areas included a variety of weeds, none more important than cabbage. This technique produced four more keepers. 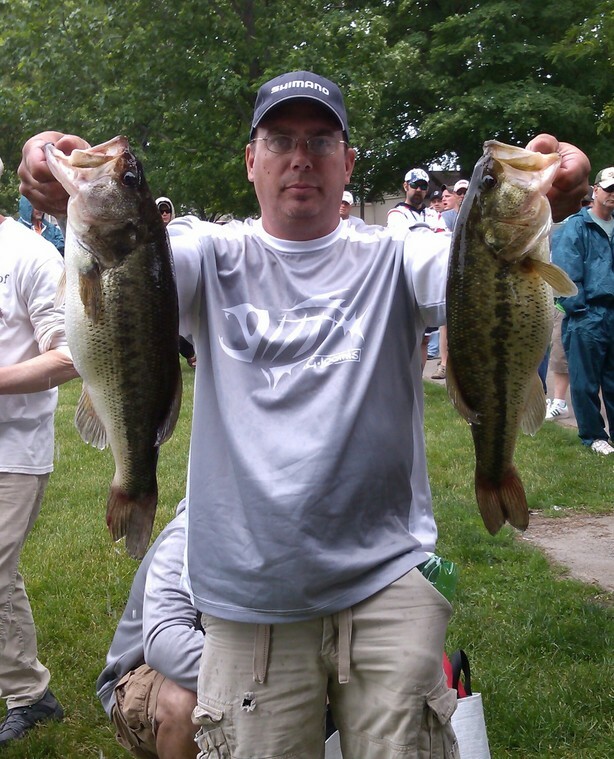 Money Mouth Big Bass Award: Where else than the R & B Bass Circuit can one fish win you $424? Maurice Cox and Mark Hamman won more money than all but two teams while weighing in a single fish. The fish was tricked by Cox’s Rebel Pop R bait while working some lily pads. He recalls, “We were working a pad field that had a big opening in it, so I threw the Pop R in it.” The lunker bass could not resist. 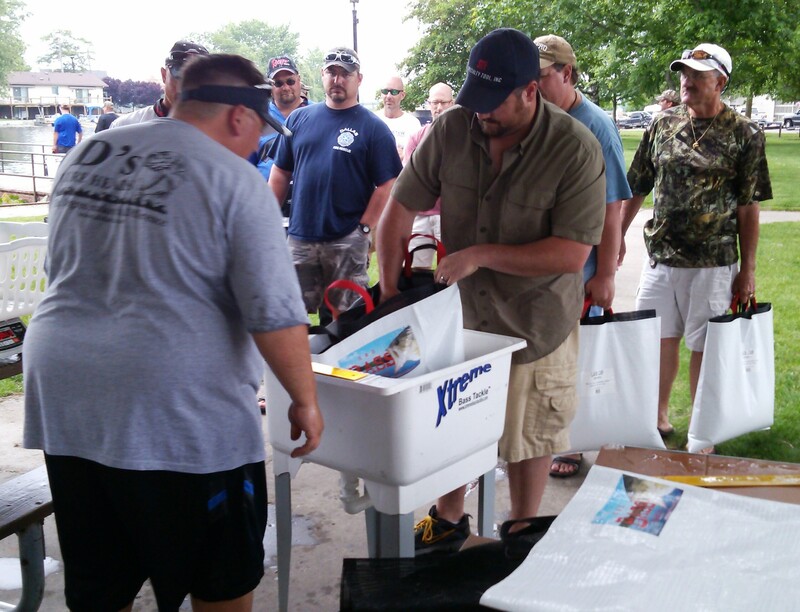 6th Place: After bagging 20 keepers, Trevor Paulus and Brad Sterling weighed 9.12 pounds to win $196. 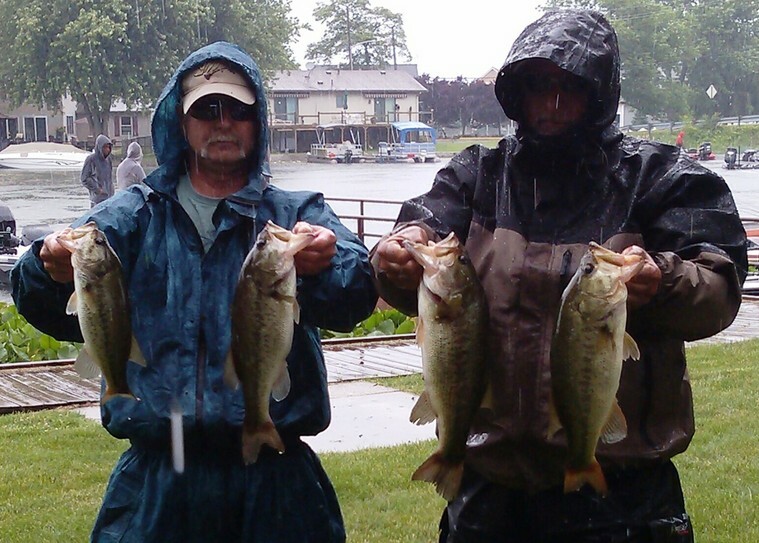 7th Place: Bill Hovermale (left) and substitute partner weighed a 9.09 pound limit and took home $168 for their efforts. 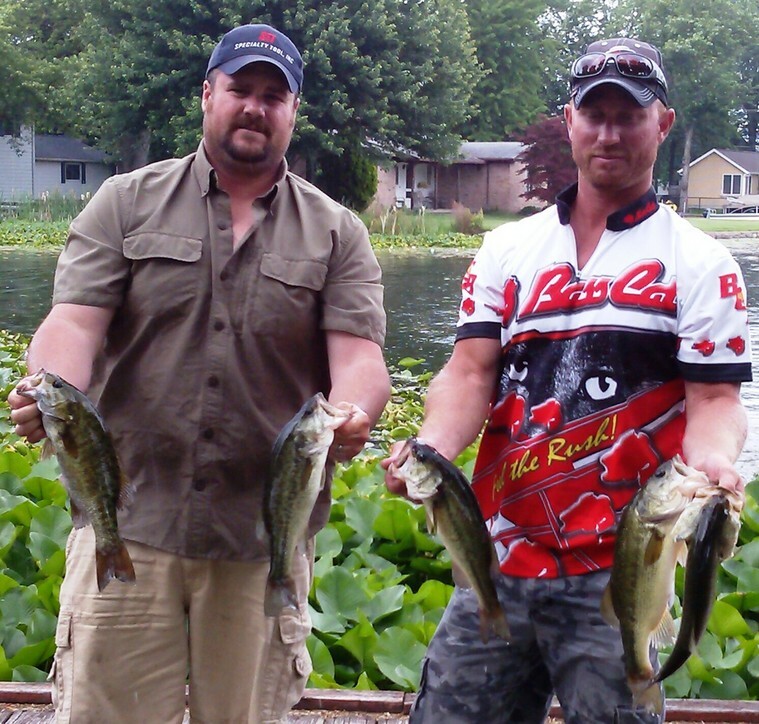 8th Place: Tournament Directors Andy Buss and Mark Fennell (right) caught six keepers on Xtreme Bass Tackle Canadian Mist tubes stuffed with 1/4 ounce D's tube jig heads. Their best five weighed 8.75 which won them $126. 9th Place: Braxton Brest and Chad Adkins tallied an 8.54 limit that won them $98. 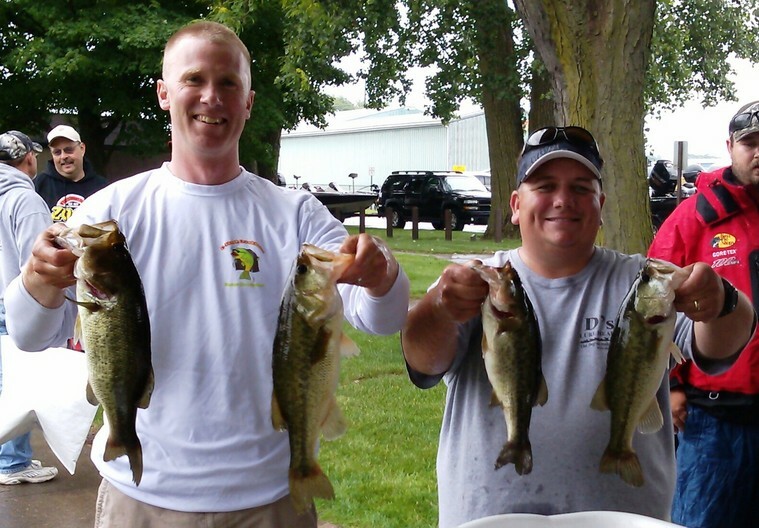 10th Place: The team of Andy Jenkins and Scott Beard returned to the R & B and won $85 with an 8.46 pound limit. D's Lures Award: Kevin Miller and Larry Schwartz bagged an 8.43 pound limit to win shirts and tackle provided by D's Lures. Starboard Choice Marine Challenge: The lucky number drawn for the $100 gift certificate. 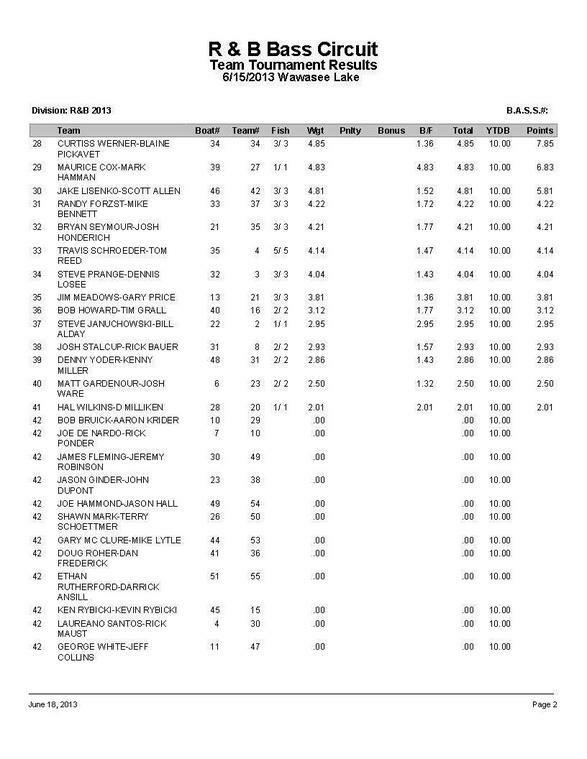 Unfortunately, Rich Paton and Dave Morrow were not eligible. Don't let this happen to you! Purchase your Starboard sticker at the next tournament! Solar Bat Sunglasses Incentive Money: Dave Miller and Craig Chupp finished 19th place and were eligible to have their next entry fee paid by Solar Bats.